President Rodrigo Duterte has warned Beijing to back off from a disputed island in the South China Sea, warning of possible military action if China “touches” it amid rising tensions over the key waterway. Duterte, aiming to attract trade and investment from the Asian superpower, has mostly withheld his early criticism of Beijing’s expansive claims to the sea—a point of regional contention because trillions of dollars of goods pass through it. But as the military warned this week that hundreds of Chinese coast guard and fishing vessels had “swarmed” the Manila-held Pag-asa island, also known as Thitu, Duterte spoke out late Thursday. “If you touch it, that’s another story. Then I will tell my soldiers ‘prepare for suicide missions,’” he added. He also said he would park five Navy ships in the area and tell the Chinese that they were well within the country’s exclusive economic zone. He has been criticized at home for taking too soft a stance on China and getting little of the billions of dollars in investment promised by Chinese President Xi Jinping. The United States, long-time Philippine ally and former colonial master, has moved to oppose any Chinese expansion in the sea. In his campaign speech, Duterte said his remarks were not a warning, but advice to a friend. “I’m trying to tell China: That Pag-asa [Island] is ours. We have been there since 1974. If that’s yours, why didn’t you drive us away? So, let us be friends but do not touch Pag-asa Island and the rest. Otherwise… things would be different,” Duterte said. In interviews after the speech, however, the President returned to his normal rhetoric, saying war with China would be suicide, and that Beijing could launch a missile that could hit Manila in seven minutes. “I am sure that it has something to do with the greater game of geopolitics and it is not directed to us. And I assure you that if they kill or arrest people there who are Filipinos, then that would be the time that we will have to decide on what to do,” he added. The country’s military earlier said about 275 ships have swarmed the vicinity of Pag-asa Island from January to March this year. Chinese Ambassador Zhao Jianhua claimed the Chinese ships were fishing vessels and were unarmed. However, the Department of Foreign Affairs on Thursday labeled as “illegal” the presence of hundreds of Chinese vessels swarming around the Kalayaan Island Group. Senator Panfilo Lacson said Friday he will join President Duterte if he decides to visit Pag-asa Island, which is surrounded by Chinese vessels. “I volunteer to join him in my capacity as an elected senator of the republic and as a freedom-loving Filipino,” Lacson said. In a Twitter post, Lacson said that Pag-asa is part of the Philippines as he quoted lines from the Philippine national anthem stating that Filipinos would not allow any invaders and will die fighting for the country. He said China should not be allowed to encircle, much less occupy Pag-asa Island. 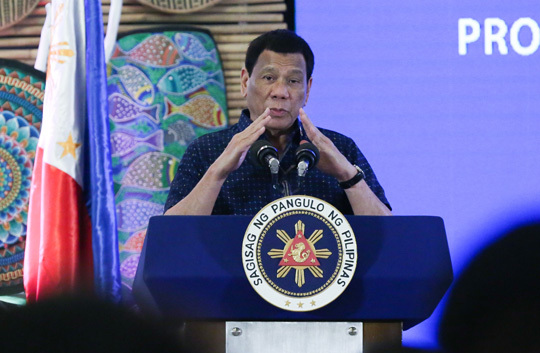 Duterte said Thursday that he would not allow China to seize Pag-asa Island even as he maintained that the country must not go to war with the Chinese. During the 2016 presidential campaign, then Davao City Mayor Duterte said if China will refuse to honor the decision of the Arbitral Court, he would personally go to the disputed territory to jet ski to the disputed areas and plant the Philippine flag. Months after he won the elections, Duterte said the “jet ski” reference was only a hyperbole to drive home the point that he would uphold the Philippines’ claims in the South China Sea. In the House, Buhay Party-list Rep. Lito Atienza welcomed the rebuke issued by the Department of Foreign Affairs and appealed to the Chinese government to stop their purported “fishing operations” in Philippine territory. “We are appealing to the Chinese leadership to refrain from any action that may deprive our Filipino fishermen from earning their living and benefiting from our natural resources. Pag-asa Island, as part of the Kalayaan Island Group (KIG), is included in the official demarcation of Philippine territory as defined by no less than the United Nations Convention on the Law of the Sea (UNCLOS). “The mere presence of Chinese vessels in the area should have required Philippine permission. But for them to shoo away Filipino fishermen in an area clearly defined as within our territory is a violation of Philippine sovereignty,” he said. In an interview on radio dzMM, the director of the University of the Philippines Institute for Maritime Affairs and Laws of the Seas Jay Batongbacal said the Philippines should seek help from the Association of Southeast Asian Nations.